If you need more proof that an iPhone 6 with an alleged 4.7" display is coming down the pipe, look no further than the increased intensity of leaks and rumors about it. 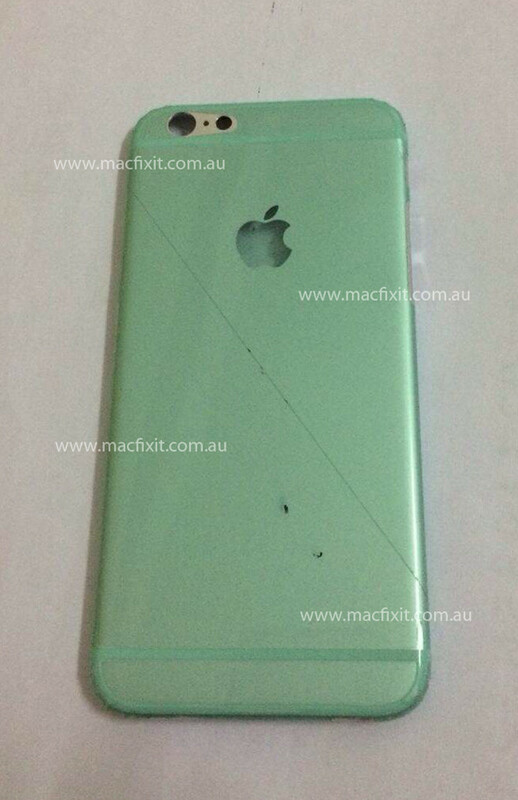 The other day we heard that the iPhone 6 will enter mass production in July, so that enough units are ready for the release in September, and now we are getting the eventual back cover of the handset, courtesy of an Apple device repair shop Down Under. If this piece on the right turns out credible, it will confirm the previous chassis leaks we've had, indicating a larger, thinner handset, with two separated areas top and bottom. The upcoming iPhone seems to be made out entirely of metal this time, eschewing the glass/metal structure in the last couple of iPhone generations. The 4.7" iPhone 6 is expected to feature a pixel-tripled 906 x 1704 resolution with pixel density on about the level of the current iPhone 5s, despite the enlarged screen size. We are also expecting a faster Apple A8 processor, improved camera, which is unlikely to grow much in resolution, if at all, and the venerable Touch ID finger scanner below the screen. Next week we should know more about the expected iOS 8 update, too, as Apple's WWDC conference is starting Monday, and it could give us a clue about the software goodies and extra features that will arrive with the iPhone 6 in the fall. Hmm... So the design of those dummy units might indeed be true. If so, this phone will look outdated. This still looks like the same dummy plastic case thing that is being leaked again and again and again. I might guess the outlined parts at the top and bottom will be replaced by glass and that that the design will be metal similar to the current 5S. Maybe there will be curved sides, but until it is announced, who really knows. As I've surmised elsewhere, I hope Apple goes for the big pixel density win and RetinaHD = 2X the current retina. LG has the technology. This is just a view of the new iPhone 6 without any of Samsung's components installed yet ;-) Also its only doubled pixeled and a tiny bit more. the apple logo will be a led notifier. taht apple logo gets my atention. maybe it will be like on the mac, illuminated. It wouldn't be a bad spot for it actually. It's definitely large enough to get your attention. Some notification LEDs are hardly noticeable on the front of the device because they have to be out of sight or risk being ridiculed. I won't lie, I like how my brother's iPhone 5s looks and feels, especially without a case. I just couldn't go back to using a phone with a 4" display. The Droid Razr M's size is my minimum cut off. I'll definitely be checking out the 6 if the display size is indeed 4.7". I never cared for those things as they light up the display which uses a lot of power compared to a simple notification light unless it goes the Active Notification on recent Motorola phones. They will probably market a line of Beats headphones that are specifically for 906p. "Beats 906. For the New HD." Hope it's not true, there's no dual led flash/ xenon flash, mostly flagships uses dual led flash two tone colors now! Or it might be Xenon Flash than its something good!